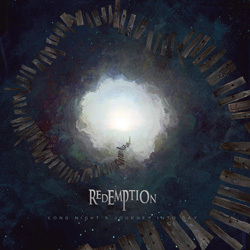 The more things change, the more they stay the same… Despite the fact that US progressive metallers Redemption have been forced to make some changes to their line-up, their overall ability to incessantly push and pull at the boundaries of convention continues unabated. On ‘Long Night’s Journey Into Day’ – a spin on the Eugene O’Neill play ‘Long Day’s Journey Into Night’ in which a family is depicted saddled with addictions and resentment – a new-look Redemption shuffles the title because, as founder member and guitarist/keyboard player Nick van Dyk says in the band’s biography, “inverting the phrasing of the title is really what Redemption’s message is all about. It’s a long night. It’s a journey, and at times it’s a struggle. But there is daybreak.” Helping deliver this message, alongside van Dyk’s long-term collaborators Sean Andrews (bass) and Chris Quirarte (drums), is Evergrey’s singer Tom Englund, a man more than capable of filling his predecessor Ray Adler’s shoes and no stranger to crafting lyrics around the doubts and frailties of life. Although co-founder Bernie Versailles is MIA, still recovering from an aneurysm he suffered in 2014, guest guitarists Simone Mularoni and Chris Poland – both of whom popped up on 2014’s ‘The Art Of Loss’ –once again serve up some well-placed but at times devastating solos. And there’s a new face at the keyboards too: Vikram Shankar came in late in the day and has now signed up.